Providers are adopting telehealth only when it directly contributes to revenue with a proven business case. This will not change for two or three more years. Vendors are positioning telehealth as a complement to care, not a direct competitor to care, to address increasing competition for low-acuity care. Whether telehealth does in fact complement clinical workflows will depend on whether the technology avoids becoming yet another silo of care delivery and clinical data creation. The growth of telehealth adoption has embodied the classic hockey stick graph. For decades, organizations such as the American Telehealth Assoc. (ATA) and a few market forecasters have touted telehealth as the next big thing in healthcare. Nothing, nada outside of a few, very limited use cases and what the Veterans Administration has been able to accomplish. It’s not that other use cases didn’t emerge, or that other patient populations would not have benefitted from telephone- or television-based care. Rather, several obvious factors stood in the way – the cost of technology acquisition and maintenance, the opportunity cost of providing care that is not reimbursed, the complexities of licensing and credentialing across 50 states, and the difficulty of scaling what was, in many cases, a cumbersome if not fly-by-night program. Above all, it represented “A New Way of Doing Things”, and we all know how well received these are in healthcare. Providers will not invest in telehealth technology unless there’s a clear indication that it will add revenue or generate savings in a value-based care model. Today, of course, hundreds of vendors offer a range of technology solutions to support telehealth, both in the hospital and in the home. The cost of such technology has dropped; in the case of many direct to consumer (DTC) telehealth apps, it’s essentially free, as many consumers already own a smartphone and/or laptop and pay for Internet access and/or data plans. The difficulty of implementing and scaling programs has dropped as well. Reimbursement parity is not universal, but barriers are slowly falling – Medicare Advantage plans can start covering telehealth in 2020, and restrictions on telestroke coverage end in 2019. The key question, though, is where on the hockey stick are we today. Is the market at the tip of the stick’s blade, with adoption destined to remain at its current level in the single digits (according to multiple metrics)? Or is the market still at the beginning of the blade, near the shaft, with adoption poised to peak at a much higher rate? Are providers catching up with telehealth technology offerings, or is the gap between what could happen and what is happening only getting wider? Can telehealth open a new front door to care, or will it remain another silo of care? 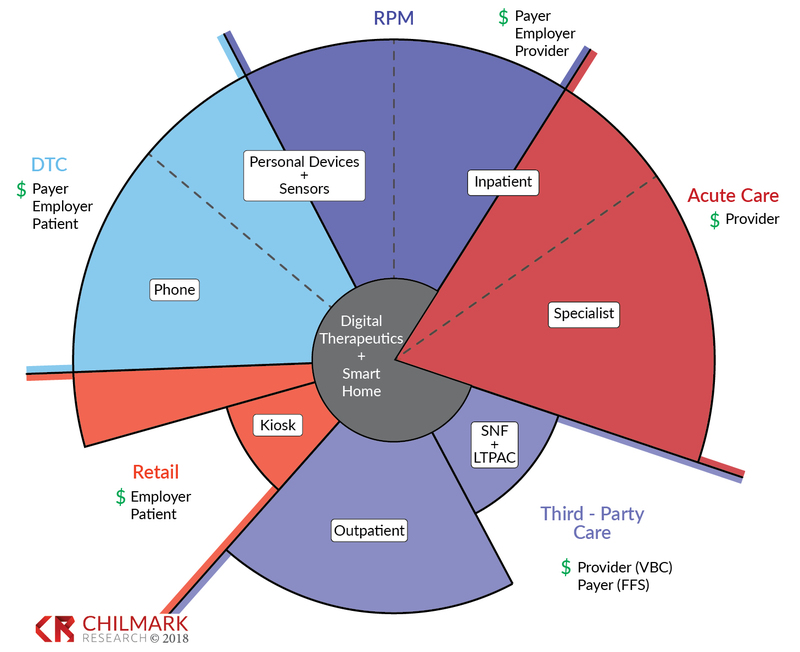 Chilmark Research’s forthcoming Market Scan Report, Telehealth Beyond the Hospital, addresses these underlying questions as part of a greater focus on the state of telehealth adoption and the potential for telehealth market growth over the next 10 years. We examine the impact on providers as well as payer, employer, and patient stakeholders. Provider organizations are warming up to telehealth. Efforts to support acute care within the hospital are expanding, especially amid growing demand and shrinking supply for key medical specialists. Efforts to augment low-acuity care are also expanding, partly in a nod to improved customer service / patient satisfaction and partly to beat back the rising tide of retail health and urgent care competitors. Not surprisingly, providers’ warm feelings towards telehealth are directly proportional to the amount of money to be made. Interest in telehealth for outpatient care is tepid and limited to scattered pilots for high-acuity remote patient monitoring (RPM), condition management, and orthopedic procedures covered under bundled payments. Without proven value-based care (VBC) reimbursement models, most providers are not willing to take their chances. DTC telehealth is pitched primarily as a tool for patient acquisition and retention so providers do not lose (or stop losing) business. While the benefits of improved care coordination and data-sharing are implied, the marketing message for DTC services typically centers on the low cost and high convenience of care. Expect this trend to hold firm for at least the next two to three years. Most providers will not invest in telehealth technology unless there’s a clear indication that it will add revenue or generate savings in a VBC model. It clearly makes business sense to avoid such financial risk, especially in times of tight margins – but it leaves an opening for payers and employers, and their clearly defined financial risks, to fill in the blanks with their own telehealth programs. As hinted in the paragraphs above, telehealth is opening new front doors to care. This is true for the three broad types of telehealth technology defined and examined in our report. DTC vendors can offer anytime access to care. RPM vendors can support patients on care plans. Acute care vendors can expand access to services, as well as expand the breadth of services available. As for whether telehealth will create yet another care silo, our research suggests that vendors as well as providers hope to avoid this fate. Hospitals are increasingly centralizing telehealth operations, which brings consistency to the user experience but also allows executive leadership to pursue a clear strategy for telehealth implementation and expansion. Executed properly, this makes telehealth a complimentary service available across a system’s care venue, not an add-on available only in limited settings to a limited number of patients. EHR integrations are increasingly common among vendors of all types – and while a visit summary isn’t ideal, it’s better than no information at all. DTC offerings are being added to those centralized telehealth departments, and most vendors are more than happy to white-label their solution on a hospital’s behalf. Acute vendors are seeking to apply their experience supporting complex inpatient workflows to outpatient and in-home care coordination. All stakeholders identify long-term, post-acute care and skilled nursing facilities as key areas of future growth, both for monitoring residents and for providing remote care that would otherwise require an emergency department transfer. The challenge lies in the execution. It’s one thing to espouse a strategy of telehealth across business units; it’s another thing entirely to take the tactical steps necessary for that strategy to become part of the everyday practice of medicine. If execution falls short, the strategy rings hollow. If we were to hazard a guess, we’d say that telehealth adoption today sits somewhere in the middle of the hockey stick’s blade. Providers remain risk-averse, taking action only when all barriers to success have been removed and the path forward has been nicely graded and paved. Payers and employers are more willing to stand up telehealth programs, but their struggles to members/employees to use telehealth benefits to achieve broader adoption is still very much a work in progress. As stakeholders keep waiting for national licensing, credentialing, and reimbursement standards to replace a patchwork of state regulations, expansion plans are put on hold. All that said, interest is growing. Healthcare business models increasingly demand the shift of care to lower-cost care venues, and telehealth provides such an option. Patients appreciate the convenience of remote care, both to avoid a single ED visit and to prevent repeated trips to outpatient facilities for follow-up care. Whether adoption reaches the tip of the stick’s blade, or whether it fails to move beyond the tape on the middle of the blade, will depend on the ability of stakeholders to position telehealth as a complement to care, not a direct competitor, and to position growth strategies accordingly. Telehealth will not serve all healthcare use cases, and it will not serve all patient populations, but mounting evidence suggests that it can support care beyond the hospital – and beyond the few use cases of yesteryear. Stakeholders that fail to take note can expect to fall behind no matter their business model.